Gum Reshaping: What is it and how can it affect your smile? Have you ever been told that you have a “gummy” smile, or perhaps you have experienced pain from receding gum tissue? If you find yourself relating to this statement, call Dr. Paul Reese in Mountain Home, Arkansas today to schedule a consultation to learn how you can have a perfect smile with the help of a gum reshaping treatment plan. Gum shaping or gum contouring involves the removal of excess gum tissue, either manually or more commonly with a laser to improve the appearance of the gum line. Ideally, the gum line should appear even and smooth, acting as a frame to compliment a person’s smile. Receding gum lines due to aging, natural wear of the gum tissue, or periodontal disease can also be repaired with gum surgery through the process of a gum graft. To better prepare you for your consultation, we have prepared a simple breakdown of what you may expect from either gum contouring or gum grafting. Gone are the days of painful gum reconstruction through the use of a scalpel, and in are the days of laser technology. Most gum reshaping procedures require only one office visit and require very minimal and painless down time. Local anesthetic is applied to alleviate discomfort. A diode laser is then used to gently remove excess gum tissue, re-contour the gum line, and seal the remaining tissue. This can all be done with very little pain and no bleeding or stitches. Light swelling may last for up to a week, but should not interfere with your daily activities. Maybe having excess gum tissue is not your chief complaint, but rather you have the opposite. Gum tissue grafting may be necessary if you are experiencing hypersensitivity due to an exposed root surface or if your gum tissue has begun to recede due to root decay. During gum grafting surgery, your doctor will most likely take connective tissue from the roof of your mouth and suture it to the gum line, allowing for more tissue to grow and closing the exposed root surface. Anesthesia will be used; your insurance may determine if you are awake but numb, if you are given an oral medication, or if you will qualify for an IV drip. Depending on your specific needs, one of two types of grafts may be conducted; connective tissue graft of the free gingival graft. Connective tissue grafts are the most commonly performed. The doctor will make an incision onto the roof of your mouth, removing the tissue that is just under the surface to repair the receding gum line. Free gingival grafts are very similar to the connective tissue graft, but use the tissue directly from the roof of your mouth. This option is used to help thicken the gum line. Recovery from gum grafting surgery is a lot like recovering from getting your wisdom teeth removed; strict diet, cool foods, and minimal physical activity. Plan for a 6-8 week recovery. The amount of pain you experience will be determined by the type of procedure performed. Do not suffer any longer with a “gummy” or receding smile that leaves you self-conscious or in pain. Call Dr. Reese in Mountain Home today at (870) 424-5900 or visit www.reesedenistry.com to schedule your consultation to determine the best treatment plan for you. All you ever need to know about Dental Bonding! Dental Bonding: How can this simple and inexpensive procedure improve your smile? Have you ever known someone that had cracked a tooth, but almost magically it had repaired itself? You thought for sure there would be no coming back from the chip or crack, but there in front of you was a happy smiling face. Would you like to know how this was possible, or do you yourself suffer from a chipped tooth or perhaps a small gap that you thought could not be repaired? Call Dr. Paul Reese in Mountain Home, Arkansas today for a consultation at (870) 424-5900 to see how dental bonding may be the right option for you. Your dentist will begin by using a shade guide to match the composite resin color to your existing teeth. Once the correct shade has been chosen, he will decide if a local anesthesia is necessary; this is often not necessary unless the bonding is being used to fill a decayed tooth. The surface of the tooth will then be roughened which will allow the resin to adhere to the tooth. The tooth-colored, putty-like resin is then applied, molded, and smoothed to the desired shape. An ultraviolet light or laser is then used to harden the material. After the material is hardened, your dentist will further trim and shape it, and polish it to match the shine of the rest of the tooth surface. Cost- Dental bonding is considered to be one of least expensive cosmetic dental procedures and many dental insurance plans cover the cost. 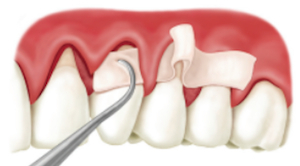 Time- Most dental bonding procedures can occur during your lunch break and typically take only 30-60 minutes. Ease- Without needing anesthesia, this procedure is virtually pain free with little to no damage done to the existing teeth. Durability- Dental bonding is not as strong and long lasting as porcelain veneers and crowns. If not properly cared for, the bond may crack or chip. Discoloration- Due to the bonding material being porous, it is susceptible to discoloration with coffee, cigarette smoke, tea, and red wine. Do not suffer any longer with a smile that you are not proud of, as dental bonding can be a cost effective and painless procedure to give you that smile you have always wanted. To achieve the optimal cosmetic results of dental bonding, call Dr. Reese in Mountain Home today at (870) 424-5900 or visit www.reesedenistry.com to schedule your consultation with a true cosmetic professional.